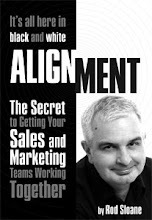 Sales and Marketing Alignment Blog from Rod Sloane: What exactly is Sales and Marketing Alignment? There is a lot of buzz at the moment about Sales and Marketing Alignment. A lack of sales and marketing alignment, has been given as the reason why so many sales guys never got anywhere near quota in 2009. But what exactly is Sales and Marketing Alignment? Is it simply sophisticated lead generation, an excuse for a larger technology investment or a new way of banging sales and marketing heads together?